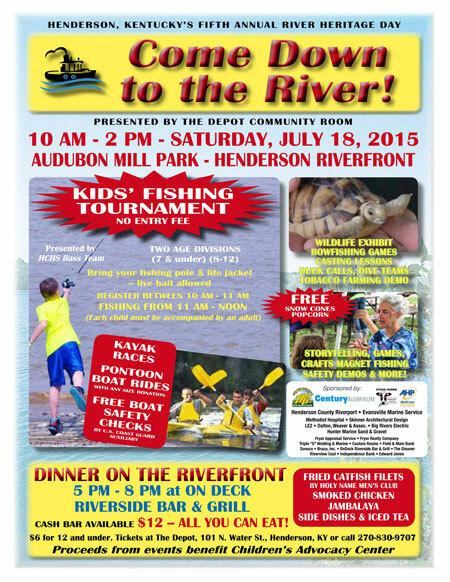 “Come Down To The River” is this year’s theme of the Depot Community Room’s fifth annual River Heritage Day on Saturday, July 18, 2015 at the Henderson riverfront. The event, which benefits the Children’s Advocacy Center, features an exciting slate of activities during the day and an evening dinner on the riverfront. From 10 a.m-2 p.m. Audubon Mill Park will be filled with activities and exhibits, including wildlife from Mesker Park Zoo, casting lessons by the HCHS Bass Team, bowfishing games from Carp Killers Association of America, storytelling, dive and rescue teams, a dunking booth, along with crafts and games for all ages. Ducks Unlimited’s Greenwing trailer will be on hand, as well as a Short Reed Duck Call exhibit. Free popcorn and snow cones will be provided. A free kids’ fishing tournament, presented by HCHS Bass Team, will also take place along the riverfront. Registration begins at 10 a.m. with two age divisions (7 & under) (8-12). Fishing will be held from 11 a.m.-noon. Please bring a fishing pole and life jacket. Live bait is allowed. Each child must be accompanied by an adult. Also on the riverfront, a kayak race will span the Ohio River beginning at 1 p.m. From 10 a.m. – 2 p.m. Team M.A.F.I.A. Outdoors will sponsor pontoon boat rides, and the U.S. Coast Auxiliary will offer free boat safety checks. From 5-8 p.m., a dinner will be served at On Deck of fish, smoked chicken jambalaya, several side dishes and iced tea. A cash bar will also be available. You can dine at On Deck or picnic in the park. Tickets for the dinner are $12 for all-you-can-eat ($6 for 12-and-under) and can be purchased at The Depot Community Room, 101 N. Water Street, Henderson, KY. Proceeds from the dinner will benefit the Children’s Advocacy Center. Corporate sponsors for this event are: Century Aluminum, Air Hydro Power, Stagg Farms, and TPG Marine/Green River Barge Service. For more information on the event call The Depot Community Room at 270-830-9707.